Growing up on Forge's streets has taught Kyra how to stretch a coin. And when that's not enough, her uncanny ability to scale walls and bypass guards helps her take what she needs. But when the leader of the Assassins Guild offers Kyra a lucrative job, she hesitates. She knows how to get by on her own, and she's not sure she wants to play by his rules. But he is persistent-and darkly attractive-and Kyra can't quite resist his pull. Tristam of Brancel is a young Palace knight on a mission. After his best friend is brutally murdered by the Demon Riders, a clan of vicious warriors who ride bloodthirsty wildcats, Tristam vows to take them down. But as his investigation deepens, he finds his efforts thwarted by a talented thief, one who sneaks past Palace defenses with uncanny ease. When a fateful raid throws Kyra and Tristam together, the two enemies realize that their best chance at survival-and vengeance-might be to join forces. And as their loyalties are tested to the breaking point, they learn a startling secret about Kyra's past that threatens to reshape both their lives. In her arresting debut novel, Livia Blackburne creates a captivating world where intrigue prowls around every corner-and danger is a way of life. 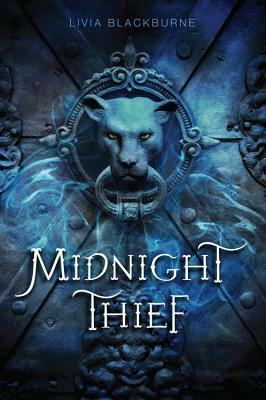 "Blackburne's fast-paced fantasy will please fans of Leigh Bardugo and Tamora Pierce." "[A] dark, morally complex adventure." "Put this in the hands of fans of Suzanne Collins and Veronica Roth." "Blackburne's high fantasy is expansive, with entertaining characters and a well-constructed world." Livia Blackburne has a PhD in neuroscience from Massachusetts Institute of Technology, where she conducted research on the neural correlates of reading. She still blogs on the intersection of writing and brain science (liviablackburne.com). She now lives in Los Angeles with her husband. This is her debut novel.